Executive Summary: Sam Lowry is a cog in the massive bureaucracy of the retro-future. He daydreams frequently, about rescuing a damsel in distress. Due to a mistake in the endless paperwork, a man is wrongfully arrested as a terrorist, and subsequently dies. Lowry, tasked with fixing the error, meets a woman who looks just like the one he dreams of rescuing. They both come into contact with the real wanted man, Tuttle, and are branded enemies of the state. ***Spoilers for a 31 year old movie*** He and Jill, the dream-girl lookalike, manage to have a romantic weekend before they are apprehended. Lowry is taken to be tortured, but Tuttle and his gang break in and rescue him, which results in a surreal escape that sees him reunited with Jill. We learn, however, that this is all a dream as his mind has divorced itself from reality and he is still in the torture chamber. Dystopian Visions: Government, information and consumerism are all major themes of Brazil. Whereas most dystopian fiction is marked by a distinct lack for the vast majority of people, Brazil has excess. People are concerned only with what they have, or can have, and are numb to the sufferings and injustices of others. The Government is bogged down by paperwork, a reality unto itself, where only the proper filing and process matters- not the truth, or if a thing is actually accomplished. Utopian Undercurrents: You can have what you want in Brazil- If you have the paperwork. And the paperwork for the paperwork. Filed with the proper office. Level of Hell: Six(?). I wrestle with how bad it is, exactly, which is part of the problem. This isn't Children of Men or Mad Max, where it is a struggle to get the barest of necessities, but rather a world made so cumbersome and claustrophobic that everything is pointless. As I've said in other pieces, I find that the more distasteful. Objectively, though, this is middle-of-the-road bad. Legacy: I may have a sort of skewed perspective on this, since I first saw Brazil when I was super young, and it had a major impact on me. It is a film with a powerful message, but it's presently with this sort of Monty Python-ish humor and absurdity, which drives it home even more. In Retrospect: There is a lot to love about Brazil. As I mentioned earlier, it's powerful and funny all at once. It looks dated now, with the colors and sets that mark it very much as an 80's film, which, depending on your preferences, make it better or worse. 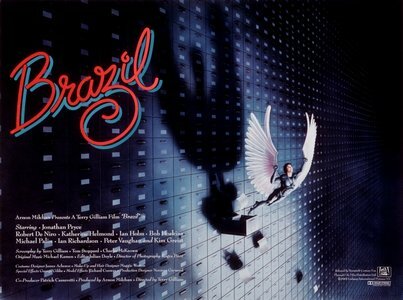 I appreciate it's originality, where a lot of dystopia takes itself seriously, Brazil does not.